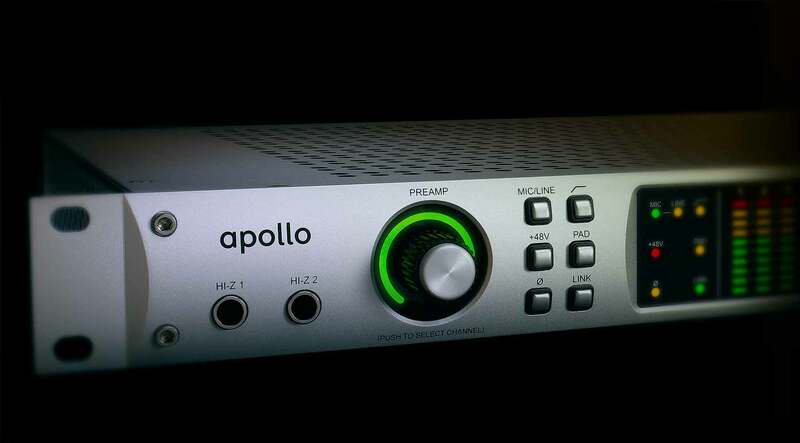 Apollo FireWire features four Unison-enabled mic preamps, letting you track through exacting mic preamp emulations from Neve, API, Manley, and Universal Audio. An Apollo exclusive, Unison technology nails the tone of these sought-after tube and solid state mic pres — including their input impedance, gain stage “sweet spots,” and the component-level circuit behaviors of the original hardware. Right out of the box, Apollo FireWire provides a suite of incredible analog emulation plug-ins including the world’s only authentic Teletronix LA-2A, 1176LN, and Fairchild compressors, the legendary Pultec EQs, and the Unison-enabled UA 610-B Tube Preamp. Developed by UA’s world-renowned team of algorithm engineers, these Realtime Analog Classic plug-ins set the standard by which all other hardware emulation plug-ins are judged. Now you can seamlessly combine two Apollo FireWire or two Apollo 16 FireWire units together for additional I/O and DSP as your studio grows, enabling you to tackle larger projects.